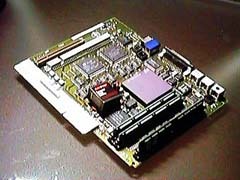 This image is logic board of LC575. Logic board exchanging accelerates all operation (Finder, application) certainty like as installing accelerator. Some logic board enables not only acceleration of CPU speed but also to expand maximum memory space, addition of CS socket and so on. There is some logic board to be able to install to Color Classic. Default logic board of Color Classic 2 and Performa275/550. CPU speed shows double score, but actually it feels more speedy. It depends on bus clock. It is LC520 logic board. Basic components is the same as Color Classic 2. There is no Apple commercial products of Color Classic installed this logic board. Therefore, application and installer may not work. If you use System 7, it will not cause any problem. But system enabler may not be installed. And you must install system enabler 403 manually. If you use System 7.5, installer failed to install default system. By pushing option key, you can select custom install. It is LC575 logic board. It is called MYSTIC installed these logic board to Color Classic. MYSTIC is not supported commercial system. If you want to use MYSTIC on System 7, you need system enabler 065 ver. 1.1. System enabler 065 ver.1.1 is not be able to find at any Apple ftp site. If you need system enabler 065 ver. 1.1, please buy LC575. But some LC575 contains ver 1.0 or ver 1.2. These can't boot MYSTIC. Software copy is illegal. Don't ask us to send SystemEnabler065 ver.1.1. Logic board is sensitive to static electricity. Let escape static electricity by touching water pipe or using wrist band. Never put logic board on carpet or so on. Never wear on sweater or acrylic one. Turn off power SW and put off any cable. Remove back panel. Pull off logic board by handling any connector. Put on new logic board. It isn't be used default back panel, when LC575 logic board is installed. Please make new panel by yourself.